Whether you are looking to buy yourself a table for “Personal Practice” or perhaps you’re building a game room for your home and office , table tennis is always a great choice. Experienced players should have no problem choosing a quality table tennis table. However , beginners and first-time buyers would easily get overwhelmed by the numerous options available at their disposal. I’ve put together this comprehensive list of best ping pong table reviews to ensure you get the best value for your money. These tables are top rated with thousands of positive feedback and a well documented product history , so you’re sure to be in safe hands. They are perfect for indoor or outdoor play. 1 How Do You Choose Your First Table Tennis Table? How Do You Choose Your First Table Tennis Table? Firstly , you need to decided where you intend on using the table. Are you going to play indoor or outdoor?. It is very important for you to know this because although they look the same , indoor and outdoor table differ in the materials used for construction. Outdoor tables are usually built with special coating on the surface to help it withstand extreme weather conditions when kept outside. The next thing you should consider is your budget. How much can you spend on the best table tennis table without feeling the effect (in your pocket)?. This is a very important factor because there are several options available at different price points , so you can always choose something within your budget. This is another good question you should ask yourself. A standard (ITTF approved) table tennis table measures 9 feet long, 5 feet wide and 2 and a half feet high. With this specifications , you can be sure the table will take a decent amount of space in your room. So before purchasing , ensure you have a place to keep the table. Surface thickness is hands-down the most important specification of a good table because it determines the quality of play and how well the ball bounces. The ideal table should have a thickness of 3/4 inch which should deliver reliable and consistent bounce. Because the tables are heavy , you may not be able to easily carry them from for point A to B for storage. So unless you intend on keeping the table in one fixed position , ensure the product you are buying has wheelers for easy movement. There’s a general consensus that indoor tables require less maintenance than their outdoor counterparts and thus , are sometimes manufactured with slightly different materials. While this may be true or not , i have no doubt that they are built with quality and durability in mind , especially highly rated brands like STIGA , Killerspin and JOOLA. Top of this list and the Crème de la crème of table tennis tables is non-other than JOOLA Inside , one of the most highly rated tables till date. The Inside offers amazing value for money and has been JOOLA’s best selling product for years , which is a testament to the quality and its popularity in the TT community. If you are a recreational , professional player , or someone looking to purchase his/her first table , we recommend this product for you. JOOLA Inside is a tournament grade table that is feature-packed and affordable. This table can be used for fun play at home & office or for serious indoor competitions with advanced players. Being an annual best selling product, you shouldn’t expect anything less than USATT approved standards. The Inside is 15mm thick and durable with medium-density fiberboard (MDF) and a multi layer painted surface which helps with a consistent and reliable ball bounce. If 15mm is not enough for you and you’re looking for a thicker playing surface , the Inside table is also available in 18mm (click here) and 25mm (click here) surface , which also has the same features as the 15mm ; only thicker. The steel legs on which the table sits are adjustable to ensure any level of playing surface that fits the height of the players. This table comes 95 percent pre-installed. So by simply attaching the legs with just 8 bolts at the different pivot points, and clamping the tournament grade net with the simple clamp design made for easy attachment, you’re good to go within 10 minutes ; sometimes less. Purchasing the JOOLA Inside gets you get a tournament grade table with a 9 by 5-foot indoor regulation size and a net perfected for indoor play. You can also play solo (if you don’t have a partner) using the playback mode by unfolding one half and leaving the other side vertically inclined. For storage, you can fold the tables into halves and have them sit on a 4-wheel trolley. The trolley, together with the anti-tilting locking devices , provides safety both for transport and during storage. 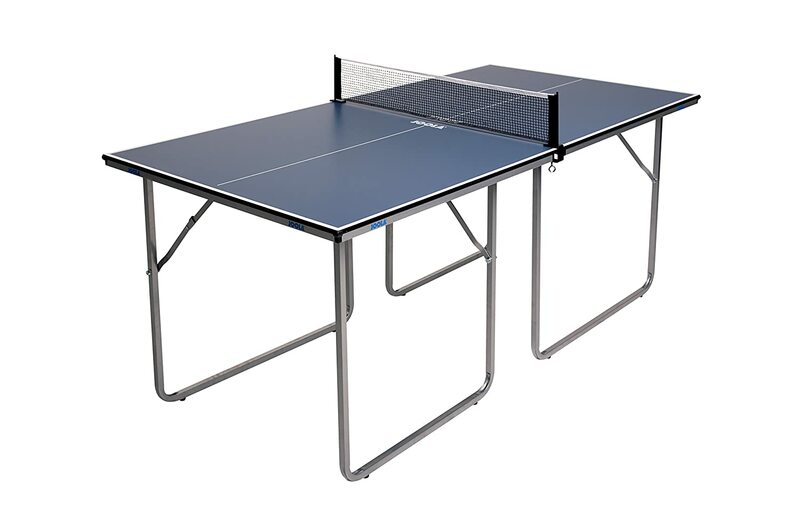 Our second choice table tennis table is STIGA’s Advantage which is another excellent indoor table with great value for money. Infact , one of the reasons why the JOOLA Inside is rated over Stiga Advantage is because they both offer great value but the Inside costs a little lesser than STIGA Advantage , which would be helpful for those looking to save a few bucks without sacrificing quality. The STIGA Advantage table would fit perfectly in your home and office and can be used for recreational and competitive play. This table has a unique chassis design where in each table half features an independent caster beam such that the two halves are completely separated and can be individually used as tables. This same independent design allows compact storage as each of the halves can be nested into each other. Advantage is a 72-inch heavy duty net and post set that comes 95% pre assembled out of the box, and you can have it fully functional within 10 minutes by following the install instructions on the manufacturer’s guide. It has a premium cotton blend net, tension adjustments as well as a clamp-style attachment which makes it easy to assemble and disassemble the net in a beat. The STIGA Advantage’s 5/8-inch-thick table top has a multiple roller coat finish as well as a silk-screen striping, while the table itself uses a spring loaded safety latch system to lock itself into an upright position from beneath the table to prevent the table from accidentally dismantling and causing any hazards. The tube aprons which are made of 15-inch steel help support the top for even bounce across the entire surface of the table and at the same time makes sure that the top of the table remains flat and consistent all the time. The apron has a durable black matte powder coating with a white STIGA logo inscribed on it. 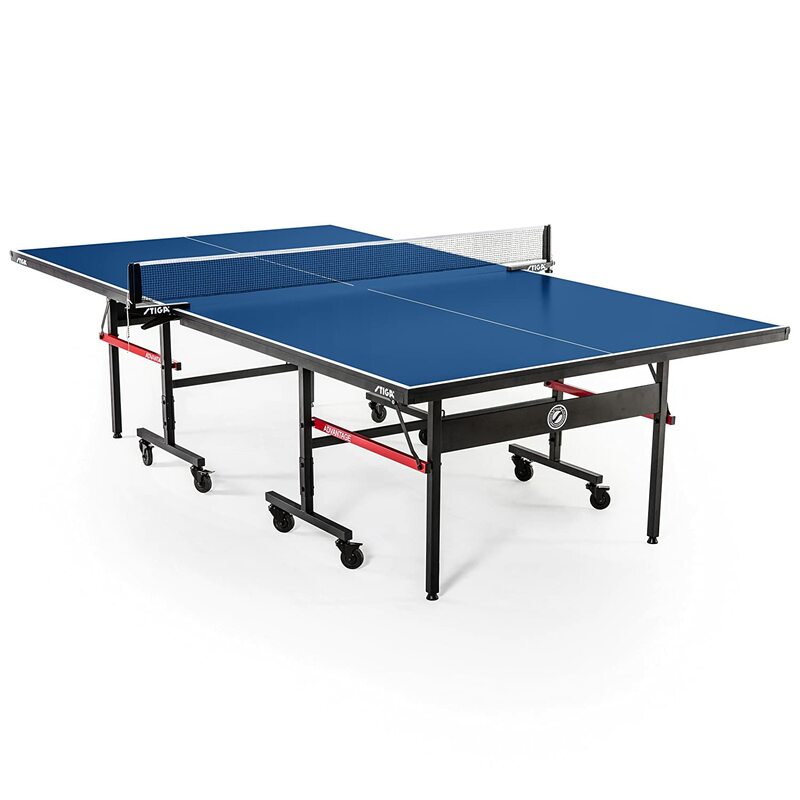 It is an excellent table for beginners although it can also be used by expert players and everyone who plays Ping Pong. Killerspin’s revolution is at the high-end of the market and is best for serious indoor tournament but if you’re looking for a table whose design can be the centerpiece of your home and office , this table is the right choice. The concept behind the Killerspin revolution is to bring innovation and youth to one of the most beautiful sports in the world. Killerspin is a Chicago-based company that produces premium quality tennis equipment. This particular model is a fusion of performance and aesthetics, and this has made it a perfect platform for world-class competitions, or in your case, the ultimate centerpiece in any game room or personal space. With its 2-piece design format, you could assemble and dismantle this equipment within seconds. It uses a bolt-lock mechanism to secure the two halves of the table. This tech is practical, stylish and very efficient for securing the equipment, movement and storage. This best ping pong table comprises of a 22mm medium density fiber board which ensures a consistent bounce all through the surface of the table. This also eliminates the concern of dead spots or warping (even though that’s very unlikely indoors). It is finished with a special Killerspin 16-layer repeat roller coating process which works for glare reduction and a ball mark resistant surface. It has a heavy-duty steel frame in an Ancient Roman architecture covered in Aluminium paneling which provides critical strength and durability for the table. Other features include a Killerspin Apex net and a steel post system, all of which are insured in a 1 year limited warranty. Looking for a tournament grade indoor table? 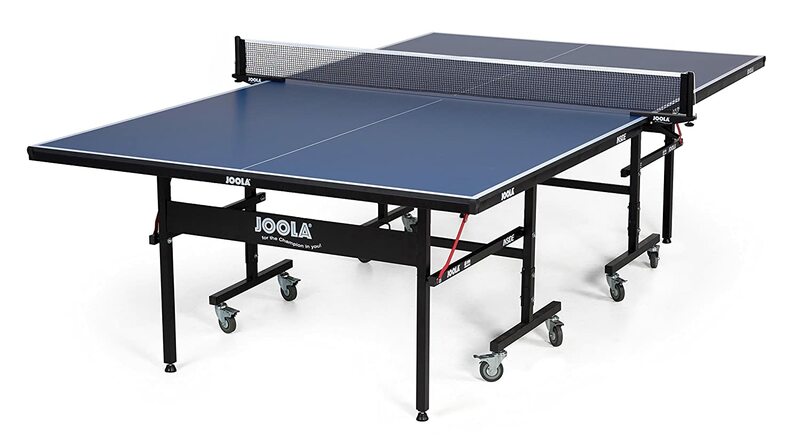 JOOLA’S Rally TL 300 is a perfect table for indoor competition and championships. This JOOLA table can be a centerpiece in your competition , given its unique black charcoal top, magnetic abacus scorers and corner ball holders, each of which can hold up to three 40mm ping pong balls. Its separable table halves can be used in solo or playback position, or as separate tables which could be improvised for other functions. The net and post set are easy to attach and assemble given its clamp style net which has simple tension adjustments. As far as durability is concerned, the Joola Rally TL 300 features a sturdy and power-coated steel legs which have rubber levelers to prevent your floors from scratching when installed or moved. It also features custom height adjustments so that it fits any surface level of play. Rally 300’s 1.5-inch apron offers an exceptional durability and bounce across the entire surface area of the table while the three-inch caster wheels glide easily such that moving the table becomes a fairly easy task. More interestingly however, each half of the table has four wheels, so, you don’t necessarily have to move them together. This in addition with the foldable feature makes it very easy for compact storage. Each of the wheels features a locking device that makes sure the table remains firmly grounded during play, or during storage. It comes pre-installed, and you can have it set up in the comfort of your venue in minutes without stress. The JOOLA Tour 2500 is a USATT approved indoor table and similar to other models , this table comes with features such as foldable tables for easy movement, improvisation and compact storage, dual safety locking devices with each of the halves having four wheels each for easy mobility and independence. However, the more distinct functions include the 1-inch thick playing surface which has a multi layer paint process which prevents warping and chipping while ensuring a better, consistent bounce and balance of the table. This also works quite well for accelerated game play. It is shielded from excessive wear by the powder coated 50mm frame and 50 by 50 undercarriage thereby increasing the life span of the table. Like others, it features an adjustable height on steel legs, and 3-inch caster wheels for easy mobility. The screw locks are pretty easy to fit, just as well as the adjustable net tension. 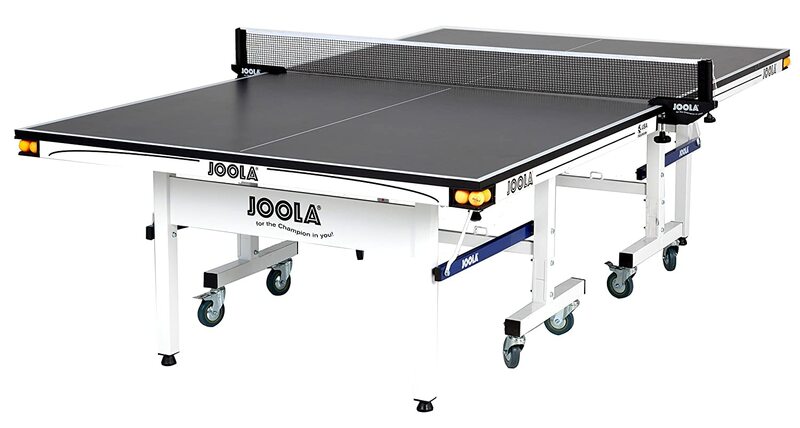 JOOLA , being a proud sponsor of the United States National Table Tennis team has this 250-pound equipment buffed up to professional grade, such that you can have a nice time or defeat your indoor rivals on standard grounds. The first thing you should know about this product is that all genuine products from the BalanceFrom brand are covered by a 100 percent satisfaction guarantee backed by a two-year warranty, because satisfaction is their highest priority. This indoor competition grade table is perfect for home or even office settings as it is designed to give the best possible full size playing surface in an easy setup. Apart from the normal dual playing style, the set up features solo playback by folding one of the halves, which also works well for compact storage and movement. The sturdy 18mm wood composite surface provides a consistent bounce for the ball and is complemented with an easy to install weatherproof net set. Assembly takes a maximum of 20 minutes as it comes pre-installed, so, you can’t expect any complications. There’s also a dual locking device as well as four locking casters per half which provides additional safety during storage and transport. The legs are heavy duty and made of steel, padded with 8 different wheel locks on each of the tires. The legs are also adjustable to meet stability conditions for different height levels of play. The surface of the table is a plain blue, therefore, the ball will be boldly reflected during play. Outdoor tables are mostly used externally and are thus , exposed to weather and other external elements. With this in mind , manufacturers put a lot of considerations into their production , especially by adding a special coating to prevent damage due to exposure. They are usually more expensive than their indoor counterparts although the difference in price is minimal , if at all noticeable. Also , most outdoor tables can also be used indoor and therefore eliminates the need to purchase one specifically for indoor use. The STIGA XTR outdoor table is manufactured with all-weather materials such as exterior grade powder coating to keep the appearance in shape, galvanized steel – which ensures a rust free, waterproof and sun resistant guarantee, as well as Aluminium for all round durability. Like other tables , it comes 95 percent pre-installed and you can have it up and running within 10 minutes. This table is perfect for your patio or places where there is least protection from climate as the top is an Aluminium composite built to resist sun damage, rust and even warping. This top is supported by a steel apron with a direct print of silk screen at the top. The 1.25-inch square legs are made of steel featuring a cross brace welded to make the table stable even under interference. It is padded with adjustable rubber leg levelers as well as a self-opening for assembly or dismantling for storage. For more convenient mobility, there are 3-inch lockable ball-bearing wheels with the locks strong enough to hold the table in place while in use, or in storage. The STIGA’s unique chassis design allows the two halves of the table to be completely separated for other uses or for a more compact storage. While folded in storage, the safety latch system under the table locks the various halves and ensures that they don’t come bearing down accidentally while in storage. The 72-inch net is of exterior grade all-weather durable material and the post set itself comes with string tension adjustments and a threaded clamp attachment system that can be screwed on and off for assemble and dismantling respectively. JOOLA is one of the most featured brands here and they deserve this credit because of their high quality products. This Nova DX model for example is an outdoor champ. With a 6mm thick Aluminium and plastic composite surface, there is a very impressive amount of resistance to chipping and warping. This formidable setup sits on a 30mm by 30mm rust resistant powder coated undercarriage. For easier and safer mobility, the table is halved, and each half sits on a separate 4-wheel trolley system. These halves could also be configured for a solo playback game, or used separately as improvised tables for other purposes. For storage, the nesting halves have solid formidable double anti-tilt locking devices which ensure optimal safety while in transport or in storage and can be unlocked by simply pressing the lever and the table starts to unfold itself. The tires on each of the tables make the set up and transport to storage way easier than carrying. The legs are adjustable to match any terrain, and can be locked with the caster wheel lock for stability and fair game play. The center net is of matching weather resistant grade, featuring a screw design and net tensioning system is so easy that can be assembled in seconds. The STIGA Vapor outdoor table is skillfully engineered with affordable Plastic-Aluminium weatherproof composite such that it doesn’t warp or fade through harsh weather conditions. The 6mm thick playing surface is also coated with rust-resistant powder, blue paint and silk screen with white tournament lines that helps maintain its appearance and increase its durability. Its durability is also marked by steel legs and support levelers which have anti-tilting action for improved bounce and uneven terrains. There are also 0.75-inch ball bearing wheels and locking mechanisms that add to the stability and easy mobility of the table. Given its dimension being 107.87 L by 60 W by 29.92 H inches, the Stiga Vapour Table conveniently folds at the center for solo play back modes (28 L by 60 W by 62 H inches) and compact storage positions. The legs are 15-inch wide steel with levelers for balancing. This 90 percent pre-assembled equipment can be installed and dismantled within minutes even though being an outdoor equipment, might not be often required. Other features include an outdoor net, an easy to install clamp set , a 1.5inch steel apron and a 90-days manufacturer warranty. 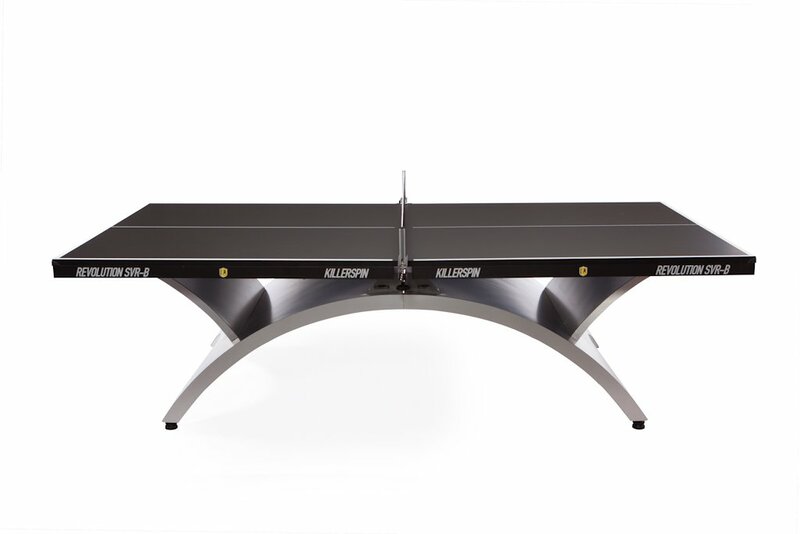 The Killerspin MyT 7 , like many other of the brands’ products , is an aesthetically pleasing table for both casual and competitive level of play. It is made out of a unique aluminum-plastic blend built to deliver optimal performance outdoors, and endure through any harsh weather or climate. Its weatherproof strength is backed by durable PVC fabric, combined with a special Ultraviolet resistant coating which prevents it from dirt, snow, rain and even sun damage. This outdoor table also comes with a MyT 7 black storm jacket/cover which also helps extend your tables’ life span. There’s also a ball pocket included (which can store up to 8 balls on each side), as well as racket pockets on each side of the table. Setup takes nothing more than 15 minutes, as it comes semi-assembled. The same applies to folding for storage and mobility. There are also 4 leg levelers which help balance the table to match the terrain or height of the players. This also works for when the table is improvised for other height sensitive purposes. Other features include a tough weatherproof clip-on net and post system whose clamp system is easy to install and dismantle within seconds. Cornilleau 250S doubles as both an indoor and outdoor table because materials that work for outdoors are just as good for indoors. This model however, features a weatherproof table top and net designed to last years. This claim is backed by a 10-year warranty on both the equipment and workmanship although warranty excludes wear parts. The Cornilleau 250s table has a resin laminate top and a frame made of galvanized steel. The laminate is 5mm thick and provides a hard and dens playing surface, while the steel frame is 1.5 inches thick. The legs are also made of galvanized steel and levelers all capsuled in resin to boost stability and durability. The reflective property of this table is managed using a patented SOFT MAT® glare reduction finish, which for most of the time, makes it less reflective or distractive as the case may be. The wheels on each of the legs are about 8 inches each and are in double formation with a notched thread. There is a racket and ball storage on each side of the table. The net is made of weather resistant polymer and has an added feature of both height and tension adjustment. The net manually folds into smaller sizes for storage and protection from wear. Germany based Kettler is known to manufacture their products in their facilities and pride themselves in delivering an unmatched level of quality towards providing their customers with innovative, durable and cost effective products lasting them years of use. Their Alu-tec aluminum tables are a pioneering technology in the development of weather resistant ping pong equipment. It entails the sealing of resin treated board in Aluminum permanently, giving it years of durability, while allowing the playing surface to retain effective bounces for exciting outdoor fun. The Kettler Champ 5.0 table has a non-glare waterproof aluminum top as well as their patented climate control tech underside to keep it sturdy and protect it from different weather conditions. This table has a pair of two-inch galvanized steel legs which prevent corrosion and resist damages such as harsh sun rays among other things. The entire equipment is foldable with a patented locking mechanism that keeps it bolted during use, while in motion and in storage without being a potential cause of accidents. You could also lock halfway and enjoy rounds of solo playback game modes. Other accessories include 6-inch dual casters with rubber surface for easier storage and mobility, outdoor rackets, three pieces of star balls, and a premium outdoor cover for protection from rain or snow. It comes with a 5-year warranty which covers repair and replacement. Buying a table is just the first step. You need to cultivate a maintenance habit to ensure they last for years to come. You can start by getting covers (if yours doesn’t come with one) to cover the table wherever you install or store it. To keep it from any unlikely incidents, keep out of the reach of children so they don’t take it apart. Also , if you have any issues with the set up you should first consult the owners’ manual provided in every purchase or get a sport instructor to help you with the set up. Also, don’t forget to take advantage of the levelers in cases of uneven terrains or say, reduction for shorter players. Finally, you might be tempted to use your indoor table outside. If you choose to, make sure it is well protected from the weather and restored to a safe storage space after use. I hope you found this list of very helpful. Stay tuned to Pingthatpong for more reviews.